Tajo makes you feel how fast Pasquale’s heart is beating when he meets “Sofronia.” His tones are soft in texture, warm and happy as he fantasizes about her (“Un foco insolito”). Notice how he blends his voice with the violins. His sound becomes resolute and a little gruff when he confronts Ernesto (“Prendo moglie”). When Norina slaps Pasquale, Tajo becomes affecting–but not to the point that the comedy is lost. From the slap onward, he is more whipped than angry. 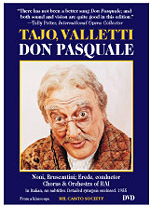 In bearing and facial expression, his Pasquale is suggestive of Walter Matthau. Tajo does mug. Much of Pasquale’s music is patter singing or chatter. Thus the role traditionally has been played as a buffo caricato (exaggerated buffo), in the manner of Fernando Corena. Tajo plays it as a buffo nobile (noble buffo), accentuating the pathos over the comedy. The bottom line is his charisma does carry the performance. As Ernesto, Valletti is heavily under the influence of his teacher Tito Schipa, who recorded the part. In certain passages, such as “Caro, caro,” in “Sogno soave e casto,” Valletti’s inflections sound Schipa-derived. He has the same wistful melancholy but not the charisma. His “Cercherò lontana terra” is understated, like Schipa’s, and he uses dynamics and tone color to contrast different sections of the aria. His top whitens in the manner of all Schipa pupils. (I myself stopped studying with Schipa in part to avoid this.) Del Monaco, Corelli and nearly all other tenors of the era invariably cover and darken their voices from the passaggio on up. Valletti in general does not. (When he does darken, it’s usually in the middle.) His capacious breath span enables him to join together some already lengthy phrases in “Com’è gentil.” He finds meaning in words others merely vocalize. His legato is beautiful–and is not at the expense of diction; his and Tajo’s is crystalline. Since shortly after 1900 until recently, most singers have used mask placement (which is now being edged aside by mechanistic approaches). Noni’s is an extreme example, with the voice far forward in the face. Her top is a little wiry. She inflects words cannily. Hers is a mature Norina, yet she is expert at playing the innocent, making her transformation into the vixen the more telling. Malatesta’s part has plenty of 16th notes, and Bruscantini articulates them without sounding choppy. His downbeats are expressive, with appoggiaturas accentuated, resolutions tapered so as to emphasize harmonic tension and deemphasize harmonic relaxation. (This is the opposite of “last syllableitis,” the prolongation or accentuation of the last syllable.) He and Tajo both have good trills and sing their patter with brio. “Opera enthusiasts are always nostalgic for singers of bygone ages; and although I would sooner have a good record than a bad film, there is a fascination just in being able to see how these marvels or monsters of the past moved. So Bel Canto Society is doing us a real favour in making so much old (and not so old) film and TV footage readily available.